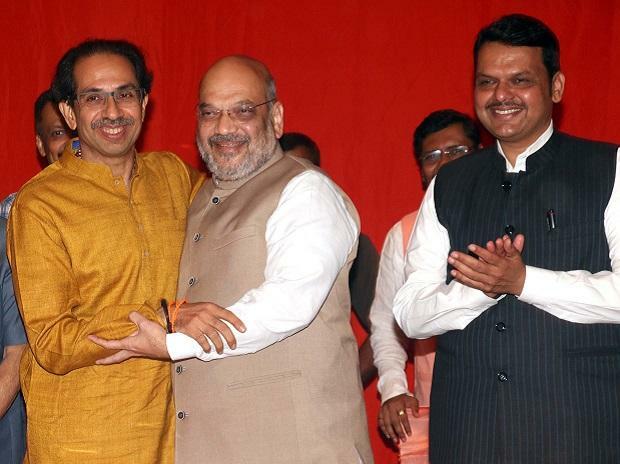 Can BJP-Shiv Sena alliance hit the double-digit mark in Maharashtra? The Shiv Sena and the Bharatiya Janata Party conducted an internal survey in January that revealed that it was in the interests of both to go together in the upcoming general elections. The internal survey, which summarised the views of party workers and the district leadership, also revealed that the two parties might struggle to hit the double-digit mark if they decided to go alone. Maharashtra sends the largest number of MPs to the Lok Sabha after Uttar Pradesh. The BJP-Sena alliance, which included the Swabhimani Paksha’s Raju Shetti, won 42 of the state’s 48 seats in 2014. Shetti is now with the Congress-led United Progressive Alliance. After their public meeting at Jantar Mantar on the last day of the Budget session of Parliament on February 13, where Opposition leaders attacked the Narendra Modi government unsparingly, their parties had decided to meet again on February 26, and also hold a public rally. The initial proposal was to hold a closed-door meeting and a public rally in Guwahati. The venue was then shifted to Ranchi and finally to Mohali. However, the Congress and others soon reached a consensus that a public meeting at this juncture might not be advisable, and that Opposition leaders needed to sit together to assess the public mood after the Pulwama attack. They will now meet in New Delhi's Parliament House Annexe on February 26, and there will not be any public rally. The official reason for cancelling the meeting in Mohali, and shifting the venue to New Delhi, has been cited as inclement weather in northern India. However, the nervousness in the Opposition camp, which was, until recently, confident of stopping the BJP juggernaut, is palpable. The Congress party headquarters on Thursday was abuzz with the news that a leader from Haryana with a significant following could be joining the party. Supporters of that leader crowded the lawns of the headquarters and journalists also trooped in to cover the news. During the event, Rao Kamalbir Singh, who heads the Janata Dal (United) in Haryana, joined the Congress and was welcomed by the party leadership. The JD (U) is virtually non-existent in Haryana and few had heard of Singh. Sensing that the gathering was rather flummoxed by the hullabaloo, Congress leader Ghulam Nabi Azad said in his speech that Singh was the brother of Haryana BJP leader Rao Narbir Singh. Congress leaders also let it be known that the new entrant was related to Loktantrik Janata Dal leader Sharad Yadav.